I have seen lots of examples of beautiful blankets created from simple knitted mitred squares. Often, these are made from scraps of yarn leftover from other projects and so they are sometimes referred to as memory blankets. I’ve also seen them called ‘ugly’ blankets because the yarn doesn’t necessarily coordinate as well as if specific yarn has been purchased for the project. I have a ‘fairly’ substantial collection of scrap yarns, but, to be honest, I’d never looked upon them as memories and seen them as purely functional. For example, they were handy for chopping a length off here and there to hold stitches, or for if I wanted to test out a new pattern. Despite my attempts to clear out (by giving some to the children), my box was still overflowing so I decided it might be time to take action. This week, I have been a little under the weather, the kids have all been ill, there’s been some sad news in the family and I am trying to keep on top of Christmas tasks and the children’s ever expanding social calendar. I needed a simple project as I just didn’t have a spare brain cell to focus on anything complicated. These mitred squares were just perfect: garter stitch, one stitch marker and a couple of decreases every other row. Easy peasy, and almost meditative, giving my brain a chance to wind down before bed. It was only as I rummaged in the yarn box that I realised my collection did hold some memories. The first square I made used yarn leftover from my daughter’s blanket and my slippers that needed so much perseverance. The next was made from even older yarn that was left after I made her a wool soaker (cloth nappy cover) when she was tiny. I also found yarn from the first ever project that I sold, and some from my best friend’s baby blanket, just to mention a few. As you can see, the colours don’t quite ‘go’. I’m still in the early stages of making, and I’m not sure how I will organise it. I’m a bit too much of a control freak to go for the ‘lucky dip’ approach to selecting yarn, and I definitely don’t want to join as I go and end up with a random blanket. For now, it’s nice to have something simple to turn to on those days when I can’t tackle anything tricky. I think I’m hoping to manage some semblance of coordination when I join them. I suspect, though, that I will just end up with a heap of squares! 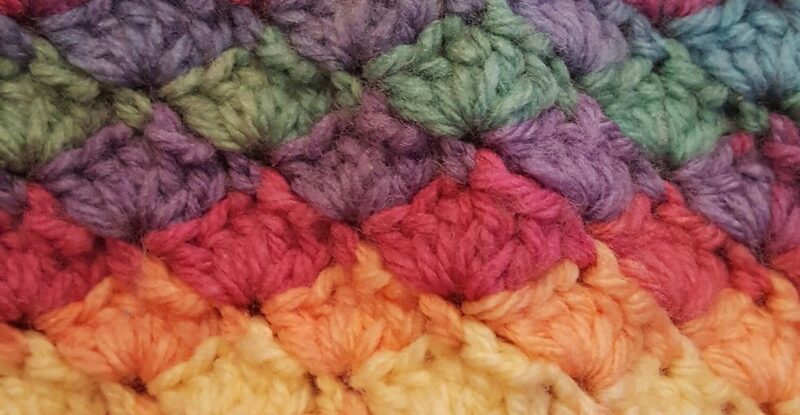 Have you ever made a scrap yarn blanket? How did you organise it? Please share if you have some inspiration for me! I think it’s going to be very special because of the memories you have of using the different yarns. Can’t wait to see how it turns out! Thank you, it may be a long wait! Yes, I’ve certainly done it with scrap fabric. Once you have a pile of squares just play around with them for a few days. It might be that you end up with a small blanket in certain colours and the squares deemed unsuitable become something else like a cushion cover…. You may have squares left over that don’t have a use. It seems at the moment that the important thing for you is just to make the simple squares,; the making of them is the important part as it’s serving a purpose. I’m so sorry you’re feeling under the weather. I can’t wait to see all the colors, though! This is going to be fun to watch grow. I have all the respect for you when you manage to finish it as there isn’t anythink that I hate more than joining motives. But they look great! And I am sure that the final result will look great also. And I also can relate to this control part that you like when things match and so, I also like that but sometimes colorful can surprise also. Thank you, I’m not looking forward to joining them but I don’t want to start now and not like the colour arrangement! That sounds like a good plan, I’m going to have fun arranging I think when I have enough! Nice to find some woolly memories. I would just keep making a pile of squares and eventually you’ll have some you think go well together. You’ll possibly end up with several blankets! Thank you, I don’t think I’ll ever knit that many squares Lol! Hello Mrs.Craft, and a very happy Sunday to you! The blanket … is going to look superb. It’s made and stitched with such love, and the fact that you don’t think the colours will go together is simply your brain telling you that *this* colour HAS to be teamed with *that* colour in order for things to flow correctly, like a rainbow does. Now I understand this because I’m like that too. However . . . I used to own a fabulous, all the colours of a rainbow, crocheted (not knitted like yours) throw. I loved it… but because it was of so many colours I didn’t think it ‘went’ with my living room. But I loved it. Then daughter No.2 asked, begged with puppy dog eyes, to have it for her house. So… being the ever caring about my daughters happiness mom that I am, I gave her the blanket/throw, telling myself that it didn’t really ‘go’ in my living room anyway. Then about a month ago – I saw a photograph, taken in her house, and the throw was in the background, and my longing to have it back is MASSIVE. I shouldn’t have let it go…. but I did, and now I’m paying for it. I sooooo want it back where it belongs. And yes, I know that infact it did look nice in my living room. It was all the victorian colours, mulled wine, deep russet, dusty blues, sage greens, french mustard yellows…. etc etc. And it did ‘fit’. Just as your lovely blanket/throw will fit wherever you put it. It WILL work. The fact that it will be random, is exactly what will give it its fabulousness. Its magic. Its beauty. Trust me, but more importantly, trust yourself. You have great instincts…. you just have the same ‘doubt in self’ that I have, and so I recognise it. I’m still working on how I can sneak it out of her house and into mine … then convince her that she gave it me back weeks ago. lol. Thank you, I like the jar idea. I hope you do get to make another blanket of your own! Thank you, I’m not actually sure I have enough for a blanket so who knows what it will become! I am doing a crochet granny square blanket from left overs. I am doing a diagonal stripe. Good luck and sorry to hear there was bad news. Thank you, I love a good granny square too! I completely understand the need you describe for a simple, undemanding project that can be worked on almost mindlessly. What a bonus that the idea you came up with also conjured up so many happy memories! Thank you, it is a lovely bonus! I think this will be a great and meditative project for busy times, and you can take as long as you want to finish it! Thank you, I like that there is no time limit as so often I ‘need’ to get things finished.